It's hard to imagine Valentine's Day without chocolate, but some scientists say that it's possible that chocolate could one day be in short supply. What would the world be like without this decadent, delectable and divine dessert? Historians say the Aztecs discovered chocolate more than 3,100 years ago and it was revered to the point of worship. Cocoa beans were linked to the feathered serpent god of agriculture and creation called Quetzalcoatl. If you believe the myth, Quetzalcoatl descended from the heavens on the beam of a morning star, carrying a cocoa tree stolen from paradise. In its early form, chocolate was consumed as a celebratory beer-like beverage described as foamy and reddish and flavored with chilli water, aromatic flowers, vanilla and wild bee honey. It was also food fit for an army. Legend has it that French Emperor Napoleon Bonaparte carried chocolate morsels on his military campaigns in the 19th century, eating it to conserve energy. 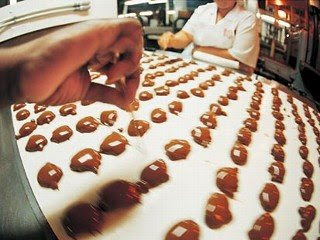 Scientists say that now it is chocolate's sustainability that needs to be monitored. The Ghana-based Nature Conservation Research Center warns that chocolate may become as rare and expensive as caviar within 20 years. A number of factors, including climate change, are affecting the farming and production of cacao, or the cocoa plant. Howard Shapiro, global director for plant science and external research for confectionery manufacturing Mars Inc. of McLean, Va., said measures must be taken soon to prevent shortages of chocolate. "If nothing was done, and the temperature was to rise, and the rainfalls were to change and drought became more prevalent ... without looking into new farming practices, then there should be a problem, and there might likely be a problem," he said. Cacao grows in rainforest conditions with high biodiversity. David Croft, the British chocolate company Cadbury's conformance and sustainability director, said, "cocoa isn't a traditional farmed crop. If you go to West Africa, it's cocoa trees underneath forest canopy or underneath a canopy of shade trees. So it's important we help to maintain that natural eco-system if we want cocoa to thrive and to flourish." Because there is a huge global demand for chocolate, farmers are now being forced to clear the forest and use hybrid seeds to produce higher output in a shorter amount of time. There are consequences to this kind of farming. One of them is soil erosion and a shorter lifespan for the cacao trees. When the trees die and the land is infertile, farmers move onto another patch, clearing forests and adding to the already existing problem of deforestation. There's also the issue of disease. As with any other crop, pests are a problem. They can spoil and devastate entire cacao growing regions. Eventually, if all the aforementioned challenges are not met, they will lead to an overall shortage of cacao and, thus, chocolate, experts say. But for all you chocoholics, before you go and hoard all those candy bars, top chocolate companies like Mars and Cadbury are doing something about it. The companies are training farmers in sustainable cacao cultivation and working with scientists to map the genome of the cocoa bean, which could help battle crop disease and perhaps even improve flavor. "I am quite optimistic with the ongoing activities, the genome, farmer training, understanding the problems, that we believe the plants will survive and thrive in the future using the techniques that we know and we can bear on the production of this wonderful crop," Shapiro said. Similar efforts are being employed at Cadbury. "In the last two years, Cadburys has really upped the game, to create more sustainable chocolate, cocoa supply chains particularly," Croft said. "We're managing all the factors reasonably well at the moment and there's a lot of anticipatory work going on, looking at cocoa trees that are more temperature tolerant, looking at cocoa trees that are more saline tolerant so that as climate change begins to impact them, we have crops that will work through that change." In 20 years, he said, chocolate "will still be the world's favorite treat."